"It was strange to find an inn there on that lonely road. Its white walls and stone roof had nestled into the surrounding woods for centuries, isolated with no other house in sight; a village inn, without a village. They came to it after a mile and half of dust and wet tar in the heat of the day. Above the door was a painted sign, showing a man, dressed like a monk with long white hair and a beard: behind him a figure in old-fashioned peasant garb struggled with the reins of a white horse, which was rearing on its hind legs. In the background were tall trees. And underneath this painting was written, 'The Wizard'." 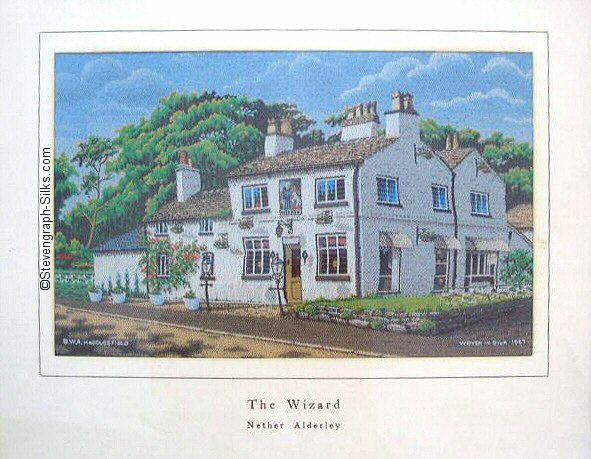 Old Cheshire Inns No 2, THE WIZARD was produced in 1967, having attracted national attention with publication, in 1960, of Alan Garner's classic tale. 'The Weirdstone of Brisingamen'.